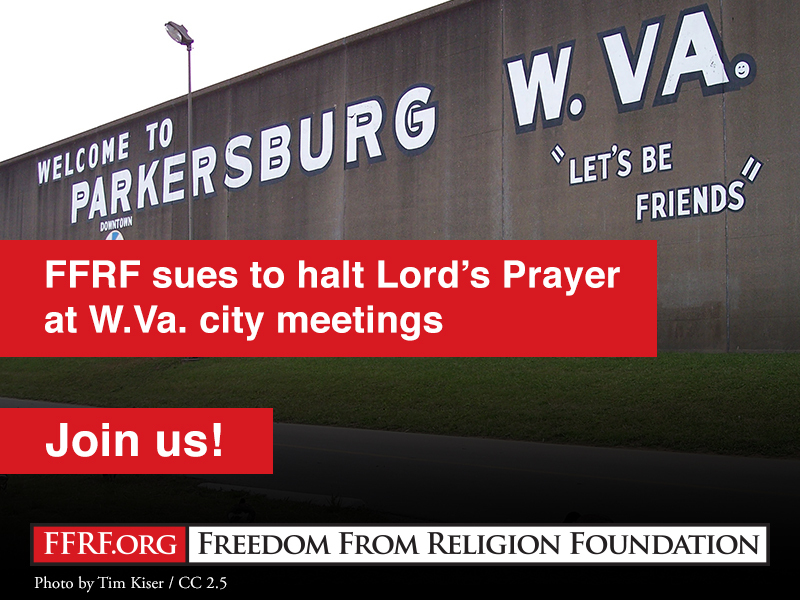 A new lawsuit by the Freedom From Religion Foundation and two of its local members seeks to ensure that the City of Parkersburg, W.Va., complies with the First Amendment by halting its unconstitutional city prayer practice. The federal lawsuit was filed today in the U.S. District Court for the Southern District of West Virginia, Charleston Division. The lawsuit challenges Parkersburg City Council’s adoption of the “Lord’s Prayer” as the official Christian prayer, which opens every City Council meeting. The recited version is a biblical translation of Matthew 6:9-13 and concludes with a Christian doxology. Council members lead the prayer and are joined by city residents at each meeting in reciting it. FFRF charges that the prayers violate well-established law and exclude residents who are non-Christian. Local plaintiffs include Daryl Cobranchi, who has frequently attended meetings and been directed to stand for the Lord’s prayer, a practice, he notes, which has made him conspicuous by his nonparticipation and which “assigns to second-class status anyone who is not Christian.” Likewise, Eric Engle, also a Parkersburg resident, follows city matters and has felt uncomfortable and pressured to participate in the Christian prayer during public meetings. FFRF, acting as a plaintiff in the case as well, is a nonprofit corporation that advocates for the separation of state and church and educates on matters of nontheism. FFRF has over 32,000 members nationwide, including more than 100 members in West Virginia. Last year, FFRF sued Mercer County Schools, W. Va., in a high-profile lawsuit to end 75 years of bible indoctrination in public schools there. The classes have ceased, with FFRF appealing before the 4th Circuit U.S. Court of Appeals, in part to request a school policy against religious proselytizing in classrooms. Marcus B. Schneider, Kristina Thomas Whiteaker, and FFRF Attorneys Patrick C. Elliott and Christopher Line are co-counsel on the case.